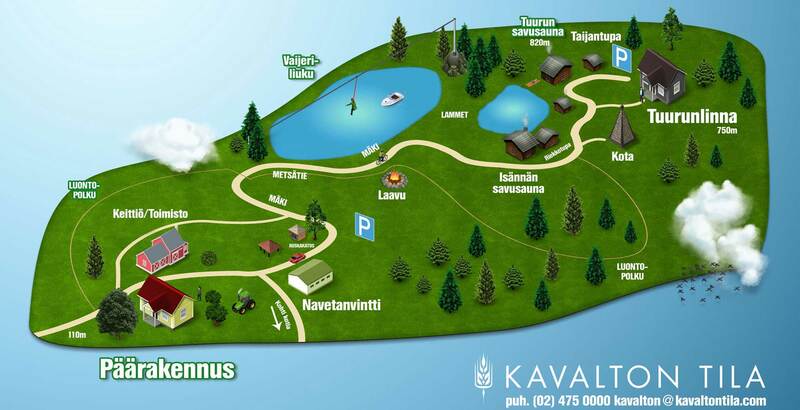 Our Navetanvintti is Kavalto country romanticism at its best. This atmospheric loft is right in the courtyard and is ideal for events for 70-180 persons. If you are setting up a wedding, a sales event, Christmas party, or maybe a festive event for the family, contact us and come for a visit. For use in meetings Navetanvintti is suitable for 50 – 100 persons. You can either choose our ready meeting package or plan an education day to your own liking. Christmas parties, parties for people retiring, and company relaxation days al will be done effortlessly in Navetanvintti. You can arrive to a so-called set table or have a detailed event tailor made just for your work community. Contact us, and we can start generating ideas together. The beautiful main building of the Kavalto Estate was built 1870. It isn’t as it used to be, since it was renovated 1924. The building oozes the feeling of the early 1900’s, complete with hand-painted wall-papers and tile stoves. The main building is particularly well suitable to family parties with a feeling and festive dinners. You can accommodate 10-40 persons. Upstairs are 2 x 2 and 2 x 3 person bedrooms for those who stay the night. Tuurunlinna is a wonderful place to have meetings and schooling events for a maximum of 49 persons. Leisurely and peaceful environment provides conditions for learning and making decisions. Our tailor-made meeting packages include eating, that is always provided to each group separately. Christmas parties, sauna soirées, and company recreation days are done without effort in a gorgeous pine forest, which holds a bit of the magic of Lapland in it. You can arrive to a so-called set table or have a detailed event tailor made just for your work community. Contact us, and we can start generating ideas together. At Tuurunlinna you can really feel like a part of the royalty of the forest. In the same courtyard there is Riekkotupa that gives extra space. Yon stay at Riekkotupa, you can use it as a dressing space and there are toilets in the same building. Riekkotupa is a cottage beside the smoke sauna with a loft for accommodation. Riekkotupa is especially atmospheric for example to spend your wedding night in. There is really a nice feeling in Riekkotupa! On the other side of the pond there is Tuurun savusauna. It is larger than Isännän savusauna, it can take up to 35 persons at the same time. The glazed over middle space gives nice further room, and in the sauna room, that is the room itself separate from the sauna, at most 27 persons can dine or just lounge. The Tuurun savusauna extra room is also suitable for meeting use. You can take the meeting equipment in your use. Extra room at Tuurunsauna is provided by the cottage Taijan tupa, that provides dressing space, group work space, or for use as accommodation. Beside Tuurun savusauna extra space is provided by Taijan Tupa. You can use it as a dressing space and it accommodates at most 6 persons. There is room for up to 6 persons to stay overnight! In the traditional Sami dwelling about 15 persons can sit and relax. Camp fire dining traditional style. Kota is an ambient space especially in the winter, here you can get close to the feeling of Lapland and its magic! Our Laavu in the forest gives you a little bit of the feeling of wilderness in our forest. Coffee, sausage self-made little buns made on the open fire are sure to whet your appetite for the experienced forest trekker, as well as a first-timer. You can fit a maximum of 15 persons at the lean-to at a time. You can rent is as is, or as a part of a feast.